Here’s a little known fact about me. I used to correspond with Ottis Toole, the serial killer. I got his address in prison from a serial killer art show and we wrote to each other for several years. I’d send him paper, pens, a few bucks and he’d reply with letters transcribed by the guy next to him or short notes he wrote himself. I also got a bunch of drawings from him. Ted, I’ve killed a lot, true! But never a child! I gain no strength from a child’s death, I gain no knowledge from killing a child! This is why I’ve never killed children. My grandmother was a witch and she taught me this. Here’s a photograph of the letter on Flickr. Ottis admitted to tons of other things, so I just assumed he was saying the truth about Adam. Why deny one thing when you admit to a thousand other things. Well, it was Ottis, why should I be surprised. The Florida police are now closing the case with new evidence that proves Ottis was guilty. It’s too late to do anything, as Ottis died in prison years ago. It’s closure for the family and one less mystery in the world. By the way, I got rid of all my Ottis letters and drawings. 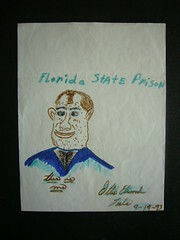 I have archived them on Flickr: Drawings by Ottis Toole. You can also try to read the letters. I did save one, a portrait of my friend Heidi, that I keep on my desk at work.